Florafelt Pro System partially planted. Plants On Walls, San Francisco. 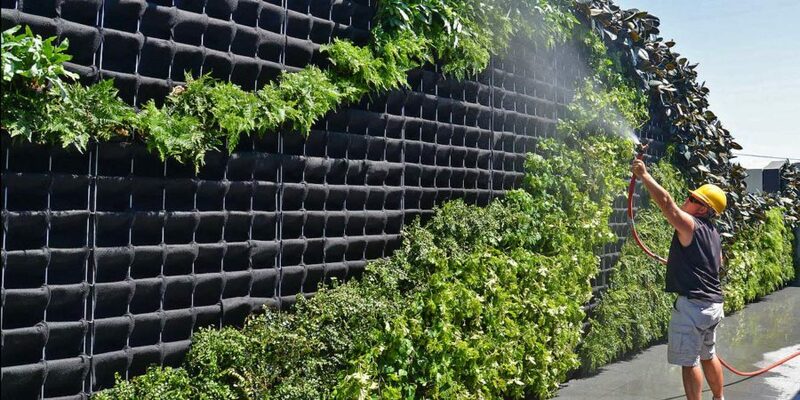 The Florafelt Pro System is an extremely robust vertical garden system designed for rugged locations.This guide will show various methods the grids can be mounted to walls or freestanding frames. 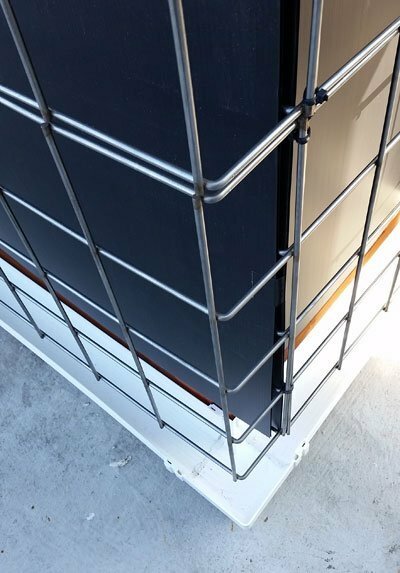 Grids can also be installed with stainless steel clips on moisture tolerant masonry walls or smaller installations where moisture accumulation behind the system is not a concern. 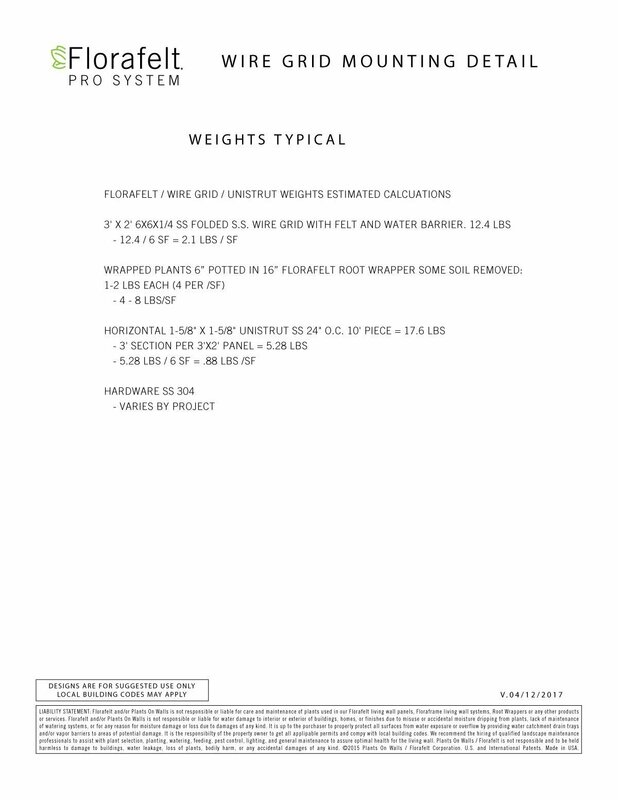 The support system consists of architectural grade stainless steel 304 wire grids that have lifespans beyond 100 years. Florafelt Pro System mounted with clips. Berkeley, California. The Florafelt Pro System can be mounted directly on walls that do not require an air gap. 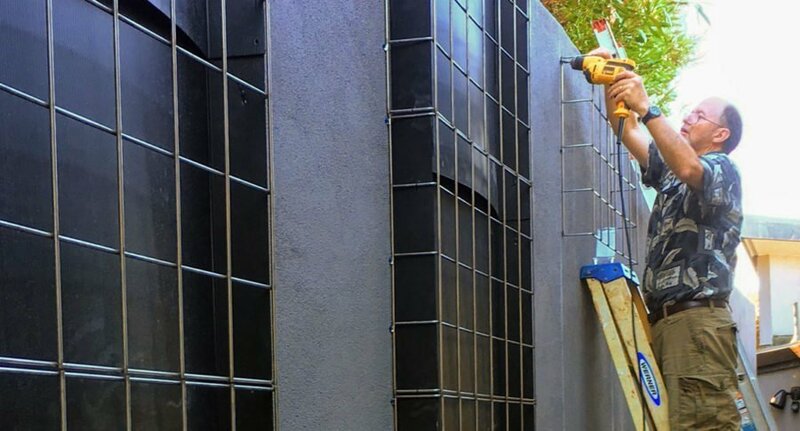 Stainless are simply mounted using easy-to-use Tapcon Concrete Anchors or other concrete anchors. If you installing on wood you can use horizontal cedar or treated lumber to every 24″ to create spacers, then attached the wire grids with stainless clips using Treated Deck Screws. Stainless clips are lightweight and have limited holding strength. If you require an engineered high-strength attachment solution see the Unistrut Mounting Method below. 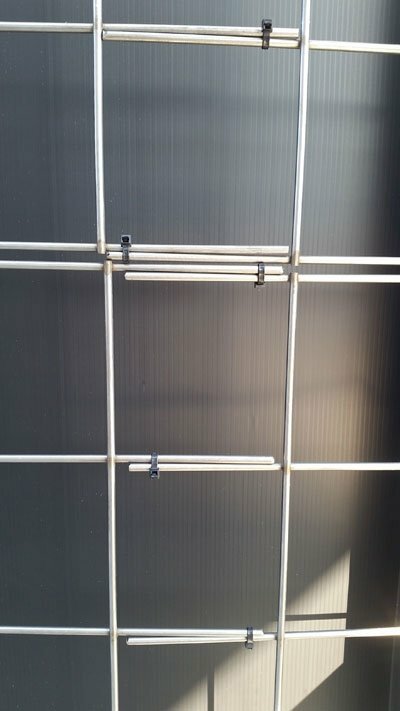 Florafelt Pro System Wire Grid on Unistrut. Planted Design, Pleasanton, California. Unistruts are a pre-engineered solution that can easily be applied to large scale projects. 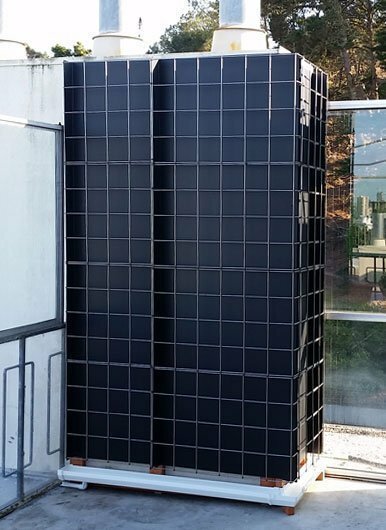 This means they can be spec’d for tall buildings where wind loads or marine environments. 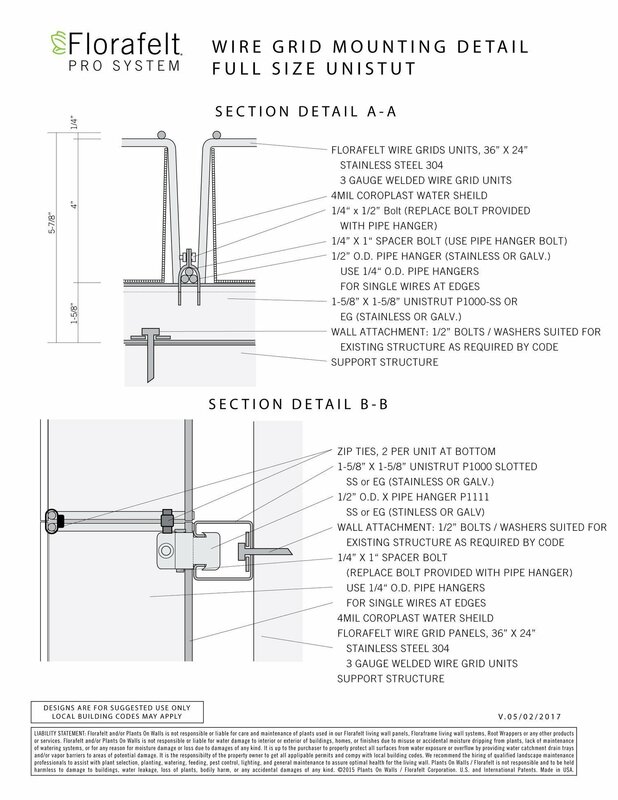 The grids are attached with Unistrut pipe clamps that also have pre-engineered specifications which help with building department approvals. As an option you can use the narrower profile Unistrut 4100 Slotted or similar. 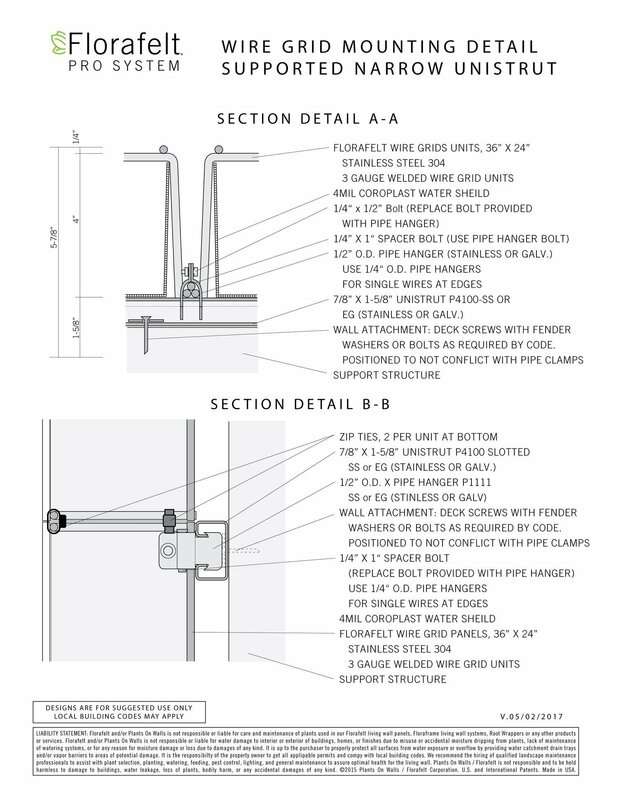 Be sure your bolts for wall connections do not conflict and are offset with the location of the pipe clamps. Grids can be cut with bolt cutters and custom sized. It’s best to stick to the 6 inch grid so you’ll get full sized pockets. Plants fluff out so it’s not visually crucial to complete fill the area with grid. Grids can be trimmed and saddled alongside the adjacent grid. Use can use nylon zip ties to make the connection. For extreme conditions stainless steel zip ties make an even stronger connection. The water barrier can also be trimmed down and folded to fit in the smaller space. Corners can be finished open for a seamless edge. 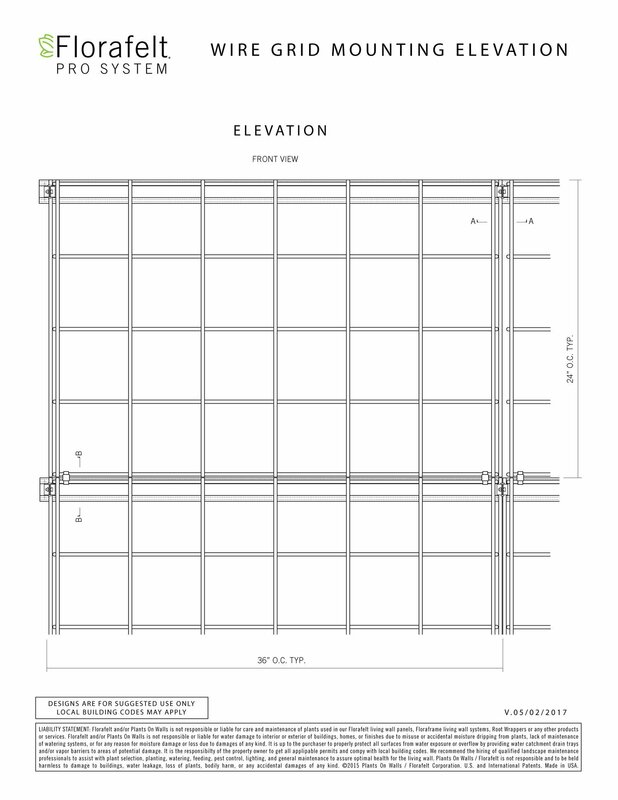 Vertically you can use any portion of the grid. It’s best to start at the top and work you way down. Toward the bottom visually you will not notice the extra gap when the plants have grown in. IMPORTANT: CUT EDGES ARE VERY SHARP AND DANGEROUS. USE A GRINDER AND/OR FILE TO MAKE THEM SMOOTH AND SAFE. 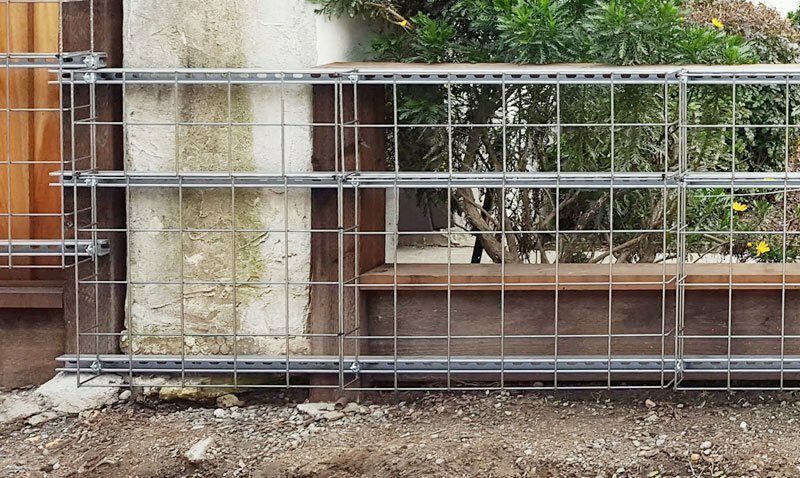 Stainless Steel Wire Grids can be easily cut with a 36″ bolt cutter. Use extreme caution and use heavy gloves when using tools and handling cut grids that will have extremely sharp edges once cut. Always use a grinder and/or file to smooth sharp metal edges because they will easily cut you during installation and may cut others once installed. Galvanized Unistrut can be cut with a metal blade in a reciprocating saw and cuts filed smooth. Stainless Steel is also harder to cut and will require a carbon steel blade. Galvanized materials are about 1/4 the cost of Stainless Steel 304. For most situations you can use Galvanized hardware that has a 10-20 year life span in most weather exposure areas. Interior Galvanized should last much longer. 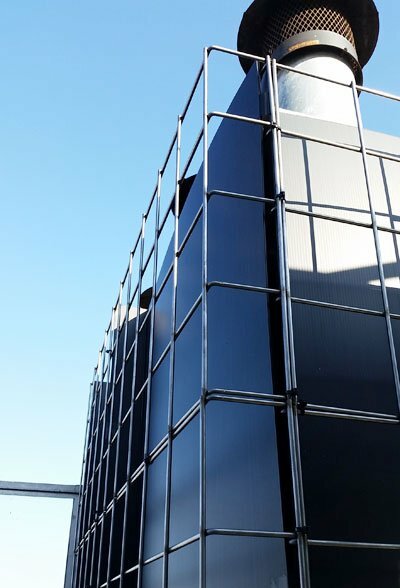 For seaside or commercial building applications consider Stainless Steel for much longer lasting materials. Suitable bolts and washers (or deck screws w/ fender washers) should be used as well as your preferred method to caulk and seal the connections if required. Be sure to choose Slotted Unistrut that has ready-made holes every 2 inches.